This beneficent celestial being works within the realm of the angels of peace, bringing inner peace through our spiritual life and calling us to serve as a catalyst or channel of world peace in any way we can. You may not feel like a ‘world server’ yet, but you can certainly call upon Archangel Uriel if you are feeling stressed or life around you seems out of control and you feel the need of some inner calm and strength to face a difficult situation. Taking a few moments to calm yourself by breathing deeply, calling his name three times, closing your eyes momentarily and visualizing deep purple, ruby red and gold lights around you (these are the colours associated with Uriel energy) is extremely effective. Ask for his light, his strength and inner peace to fill your mind, body and soul, and breathe the peace down into your body imagining every cell becoming calm, strong and peaceful. How better to radiate our light and ‘walk our talk’ than by developing a strong sense of inner peace in all situations? As we approach the Summer Solstice, let’s spring into action and put fresh energy into our own spiritual life. This is a great time to reflect on our own spirituality, perhaps reviewing our own beliefs and practises, gently discarding anything which no longer ‘fits’ or feels right. Try this powerful ‘pure light’ meditation which is specifically for clearing and purifying the top chakras, heart, throat, third eye and crown, when working with angels, archangels and higher beings for raising our vibration and enhancing our spiritual life. Switch your phone to silent, light a candle, make yourself comfortable and take some slow deep breaths. Imagine a pure white lotus flower opening slowly on your crown with a beam of light shining from your head upwards through the heavens to the Source of all pure love and light . Down this bright beam of light comes a small ball of light, as bright as a crystal, containing all the colours of the spectrum. Imagine it hovering above your head blending with your higher consciousness, or spiritual self. Invite this vibrant, living, ball of pure loving energy to cleanse and purify your crown, letting go and releasing all thoughts or memories which may contain energy or truth which is not yours. Ask that these thoughts and memories be dissolved in the loving light. Now visualize the beautiful little ball of radiant light hovering down to your third eye, between your brows, and feel the warmth from its energy as it shines light into your third eye cleansing and purifying anything which is not of the purest love. Again release and let go of any thoughts or memories you may be holding which are not of the purest love, and ask that they be dissolved in the loving light. See the light as it moves down to your throat, and feel the warmth as it shines its colours towards your throat, inviting the light to cleanse and purify anything it may find there which is not of the purest love. As the little ball of loving light hovers down to your heart open your heart as you breathe deeply, inviting the ball of pure energy to cleanse and purify anything you may be holding there which is not of the purest love. Now ~ if it feels right for you to do so ~ you may call upon Archangel Uriel and ask that he shows you how best you may serve as a channel of peace. Sit for ten minutes (or longer if you wish) in this wonderful peaceful energy, and then thank the angels and watch the little ball of light return upwards in front of you to the crown. Visualize it returning up the beam of light to the Source of all love and light, closing the beam to a thread of light, which is always with you. Breathing steadily, and consciously in you rmind, close your crown, third eye, throat and heart, and protect your energy by stepping in to an imaginary bubble of light. Continuing to breath deeply, bring yourself back into the room, make yourself aware of your own familiar surroundings, and take few moments to be fully present once again. Remember also to drink plenty of water, especially if you feel light-headed. It’s a beautiful, calming exercise that will help clear away your worries and stresses. 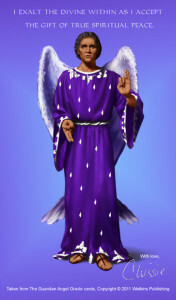 You may even feel Uriel’s call to spread this peace far and wide in service to others. Hi Angela, I’ve only just seen this question – sorry for the delay.